Take a look inside Kevin Love's yoga session with instructor Kent Katich and learn six poses from his flexibility-focused yoga routine. Kevin Love spends much of the year on the hardwood, but for chunks of his off-season it's a floor where sneakers are not allowed. Basketballs are replaced with foam blocks, and instead of shouting coaches, Love focuses on the soothing voice of yoga instructor Kent Katich. "Yoga has given me a newfound balance, strength and endurance," the 6'10", 240-pound Cavaliers forward says. "And my body has leaned out because of it." The use of yoga in the NBA isn't cutting edge (Walt Frazier took it up in the '70s), but Katich, who works with dozens of pros, from former NBAer Reggie Miller to soccer star Jermaine Jones, hopes to make the ancient practice mainstream in sports by targeting the needs of individual athletes to improve performance and prevent injuries. For Love, that means flexibility and stretching; for former NFL running back Eddie George, it means a workout that emphasizes strength and explosiveness. "Kevin's left hip is stiffer than his right because it's his dominant jumping leg," says Katich, who was introduced to Love after the then UCLA freshman saw him working with Warriors guard Andre Iguodala at Katich’s nearby studio. "We do a lot of hip and gluteal stretching combined with core strength, standing balance poses and breathing." Love, who incorporates a handful of poses into his in-season workouts, says his go-to pose—"also my least favorite because I have to hold it for one to three minutes"—is the pigeon, a hip-opener that lengthens the piriformis muscle in the glutes. 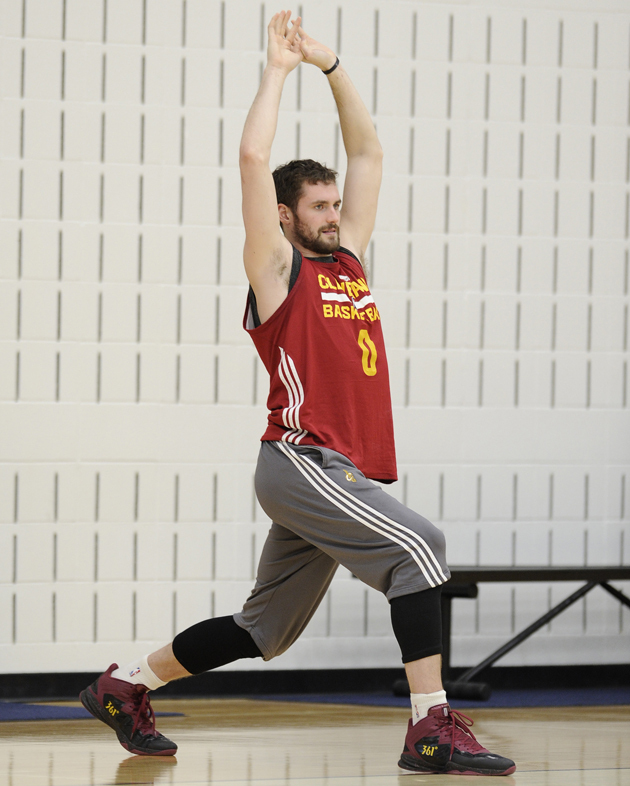 Cleveland Cavaliers forward Kevin Love stretches to loosen up his muscles prior to a team practice. ​Katich also emphasizes breathing techniques and mental discipline. “In most workouts, breathing is not the emphasis it is the byproduct, but in yoga, it is co-important with the actual movements and postures.” And instead of using Sanskrit words for poses, Katich opts for English versions: Think downward facing dog in place of adho-mukha svanasana. He says it’s been tricky to stay true to the practice of yoga while not alienating people through fear or stereotypes, but hopes that athletes like Love can make yoga more appealing to males. Not all of Katich’s clients embrace meditation into their yoga practice, but he says Love took an interest a few years ago and now adds it in for about 15 minutes at the end of the session. “Yoga is different for these guys because of awareness—it’s a mindfulness of how the body functions and how it makes you feel that might not be happening in the weight room,” says Katich. While scheduling problems and consistency can inhibit progress, Katich says Love has transformed his overall physique since his rookie season in 2009 because he successfully incorporates yoga throughout the year. "The things that we've built in yoga over the past years are all applicable to basketball," says Love. "For me, yoga is not just a way to keep my body moving, but it also helps me to escape the natural pressures that come from waking up and walking out the door in the morning." To say nothing of those that come from stepping on the court. After 18 years of working with pro athletes, Katich partnered with yoga company Gaiam to create videos that complement a specific sport's training regimen. Here are six poses from Love's flexibility-focused yoga routine. Katich: "Part of the thing is to keep him interested—incorporating balance poses and blocks challenge him." Katich: "Lie on your stomach and reach back to grab the ankles for a stretch that is good for the back and midsection." Start in push-up position. Shift weight to the outside edge of the right foot, then stack the left foot on top. Stretch the left hand toward the ceiling and gaze upward. Hold for 15 to 30 seconds and switch sides. Katich: "The challenge here is for him to maintain isometric strength with his arms extended." Begin by laying down on your back. Grip the outsides of the feet with your hands and open the knees slightly wider than the torso and then bring them up toward the armpits. Flex the feet and push your feet up into your hands. Katich: “This is a little more of a restorative pose, but it doesn’t take a lot of effort to get into it and stretch the hips." Start from a wide stance and turn your right foot 90-degrees to the right. Bend the right knee while keeping the knee over the ankle and raise arms parallel to the floor. Hold for 15 to 30 seconds and switch sides. Katich: "This lengthening pose can strengthen and stretch the ankles and feet." Katich: "Being able to bring your feet, legs, shoulders and head off the floor, and hold that while isolating the core helps strengthen your back and is a variation to traditional sit-ups."